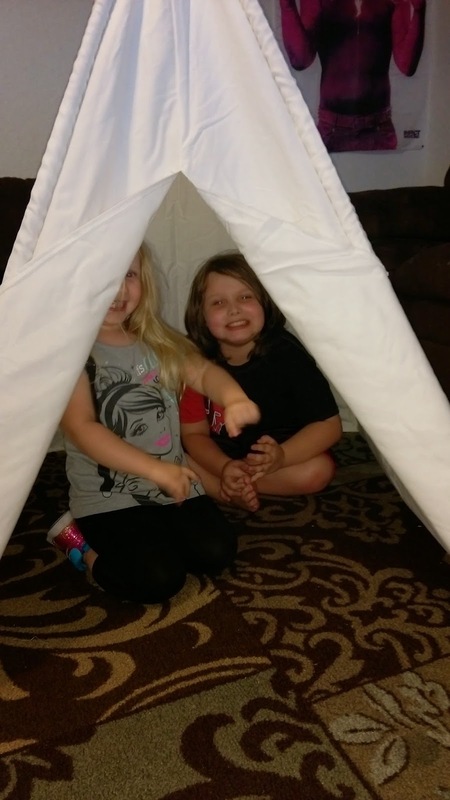 Andrea's World Reviews: Spring Fling - Win a $50 Pacific Play Tents Gift Card! Spring Fling - Win a $50 Pacific Play Tents Gift Card! What I love most about spring, especially the beginning of spring, is the weather. It is nice and warm and sunny, grass is green and soft and everything is beautiful. Most importantly, is it's not too hot yet, like it becomes in the summertime. The perfect weather for playing outside. My kids love their technology. Their iPads and computer are the main focus pretty much all day, except for when I let them play outside. That's why I want them outside, every chance I have. But since we leave on a corner street, meaning a(busy) road right in front of our house and a road (dead end) on one side (passing the front and back yards). That makes me a bit nervous, even when I am right there with them because things can happen in a split second. I only like to allow them outside if I know they will be content in the activity we are doing, and I will be able to watch them and keep them in a set area, away from the street. Luckily, Pacific Play Tents has a great selection of fun toys that would all keep my kids' interest. One item in particular really jumped out at me immediately, and I knew my kids would fall in love with it. The Painting Teepee is incredible. 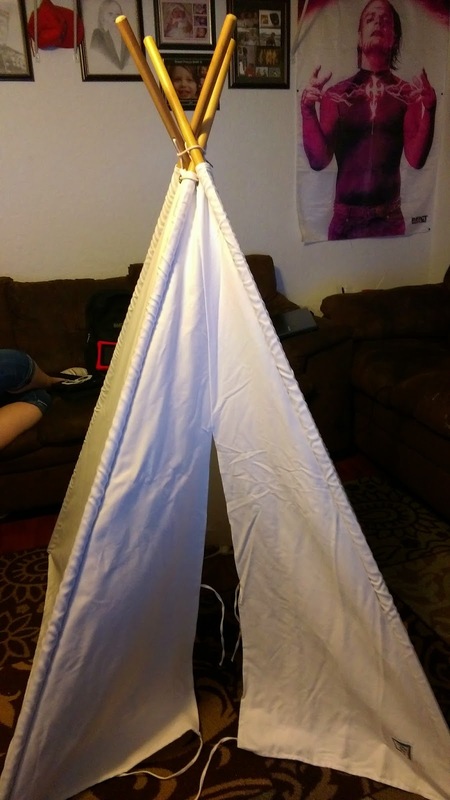 For my kids, having their very own teepee to play in will make them very happy, but being about to actually paint it with any design they desire, will be the quintessence of fun for them. My will especially love this Painting Teepee. He has told me several times that he wants to be an artist when he gets older. While I am sure that will change dozens of times before he is an adult, he clearly loves art, and he draws every single day. I really love that this is a fun fort type item for my kids, but it is way more special than a conventional play house or tent. I, being part Native American, actually wanted a teepee when I was young, even though back then, to my knowledge, play teepees did not exist. I wanted a real one, and now, getting this for my children kind of fulfills my childhood wish as well. 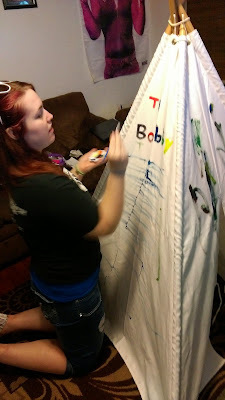 I have not gotten it yet, but it is on its way, and I cannot wait for the kids to see their amazing Painting Teepee. In fact, I can't wait to see it either. While I always love playing with my children, I do not always enjoy the particular activity. 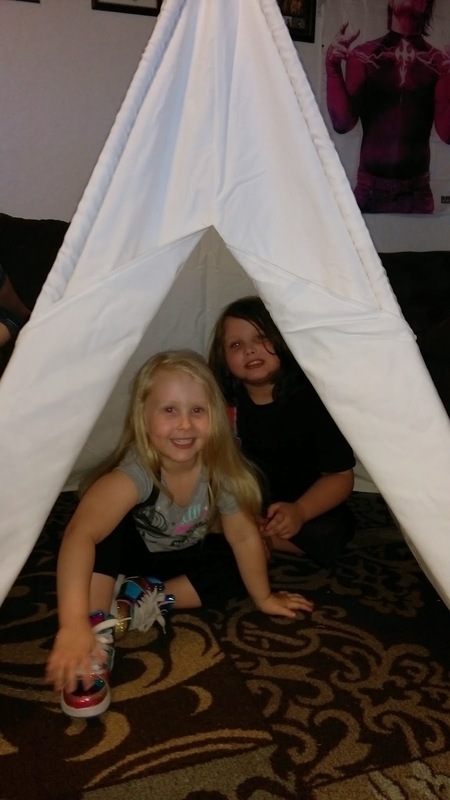 I know I will love playing in this fun teepee with them. At an impressive 64" tall, I will be able to do so comfortably. Best of all The Painting Teepee is the perfect activity for getting fresh air and unplugging from technology outside, but it is also perfect for curling up with a good book or watching a video on the iPad inside. 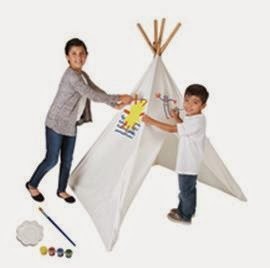 Either way, The Painting Teepee is sure to bring countless hours of fun to anyone with the good fortune to own one. UPDATE: We received The Painting Teepee a couple weeks ago, and it is ever better than I could have imagined. Even assembling the teepee is fun, and the kids wanted so badly to help me. They are so excited to get it put together, from the very moment they saw the box. My daughter (3) kept calling it a tent at first, but she does have a tent and she clearly knew this was different (better), which is why she was so excited. My son knew it was a teepee, which just made me so happy. He said, "Just like the Native Americans!" Seeing my son appreciate and understand the culture like that is wonderful. 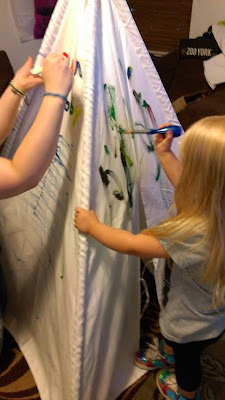 As much fun as just playing in The Painting Teepee is, decorating it was even more fun. My sister was visiting on the day that we decorated it, and it simply proved that you are never too old to enjoy creating something special to adorn the walls of a teepee. In fact, I am pretty sure she had more fun than the kids did. Once I put the camera down, I was able to join the fun too. While I am a horrible artist, it was so much fun to paint something from my heart on a teepee my children will play in every day for a long, long time. It's like I was giving a piece of myself to them in a way that is different than I have done before. There is so much I could say about The Painting Teepee, but, as silly as it may sound to many of you, I cannot accurately describe what makes this teepee so special. It is just a feeling that we all have, this is so much more than a toy. It is different and fun and high quality, and a product I am very proud to share with my children. While I wish I had the pleasure of giving away one of these incredible Painting Teepees, I do have honor of giveaway a $50 Gift Card to Pacific Play Tents, which can be used toward any of their amazing items. Enter below for your chance to win this wonderful prize. Be sure to enter the other Spring Fling giveaways as well via the linky below. Good luck. I know my niece would love the pink camo bed tent, thanks for the chance! I like the Cottage House. My favorite is the Cottage Bed Tent, it's so adorable. I like the 12 ft. Institutional Parachutes. I love the Jungle Safari Tent & Tunnel Combo! I love the Kings Kingdom Combo. I really like the kings kingdom condo. The kids would love going through the tunnel going to either end. Under The Sea Beach is my favorite! My 1st Garage Play House is cute! My daughter would love the jungle safari tent. I like the One Touch Lil Nursery Tent! I like the pink stripe cotton canvas teepee. I like the Command Headquarters w/Tunnel Set. With 3 granddaughters and 3 new nieces on the way...I have to choose the Secret Castle Bed Tent. I love the cottage bed tent. So cute. I love the Ladybug Tent & Tunnel Combination. I like the jungle safari tent. Kings Kingdom Combo - with 3 boys under 5, we need LOTS of play room! I love the Under The Sea Beach Cabana. It would be so much fun to have at the beach this summer! Spring Fling - Win a Huge Spin Master Prize Pack!